Bones found in caves in North Yorkshire have dispelled myths about the extinction of a British hunting cat. The discovery in Moughton Fell Fissure Cave, near Settle, in the 19th Century led experts to believe the lynx became extinct in the UK 4,000 years ago. But new carbon dating of other bones found at Kinsey Cave in the 1920s and 30s suggests the animals were still around in early medieval times. The findings have been described as of "national significance" by researchers. 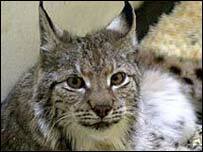 Funded by the Yorkshire Dales National Park Authority, carbon dating revealed the Kinsey Cave bones were only 1,500 years old, indicating that the lynx was hunted to extinction or lost its territory when farming intensified. It had previously been thought they became extinct when the climate cooled and became wetter much earlier. Conservation archaeologist Robert White said: "The findings do surprise us in that the lynx became extinct 2,500 years later than we thought. "The findings also highlight the importance of keeping archaeological collections safe for future research using more advanced technology." Langcliffe farmer Tom Lord has been helping experts with research in the area. He said: "It is of national significance. "Craven has the greatest number of lynx records of any of the limestone cave areas of Britain - nine of the 25 British cave sites that have yielded lynx bones are in the area. "What this means is that you can be fairly certain the lynx became extinct in the medieval period due to humans - considerably later than was previously thought."